The Federal Law Enforcement Training Center (FLETC) is an organization, rather than a single facility, dedicated to training personnel from some 75 federal law-enforcement agencies. In addition, it provides training to personnel from state, local, and international agencies, and to those from federal agencies not immediately tasked with law enforcement duties. In addition to its headquarters, at Glynco, Georgia, FLETC has a facility in Artesia, New Mexico, a temporary training center in Charleston, South Carolina, and a facility in development in Cheltenham, Maryland. Founded in 1970, FLETC is today part of the Department of Homeland Security. 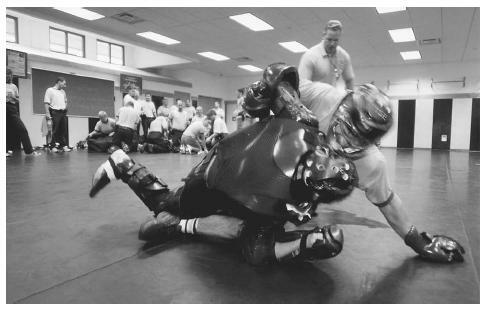 An instructor, background, teaches two Park Service Rangers the finer points of arresting a combative subject at the Federal Law Enforcement Training Center. where a talented and educated cadre of instructors could provide comprehensive training using modern facilities and a course content that would ensure the highest possible level of proficiency among students. The result was the establishment, in 1970, of the Consolidated Federal Law Enforcement Training Center (CFLETC) as a bureau of the Department of the Treasury. Originally the headquarters of CFLETC, today known simply as FLETC, was to be in the Washington, D.C., area. After three years of construction delays, however, Congress requested a survey of surplus federal installations, and this resulted in planners reviewing the former Glynco Naval Air Station outside Brunswick, Georgia. In May 1975, Glynco was chosen as FLETC headquarters. The Glynco campus, located between Savannah, Georgia, and Jacksonville, Florida, is similar to a town, and in fact it has its own zip code (31524). Included on the site are a practical exercise complex comprised of 34 buildings; enclosed firing ranges; a driver-training complex; numerous physical training areas; classroom buildings, which include laboratories and other specialized facilities; a computer resource learning center and library; and a television studio with the capability of broadcasting to field units throughout the United States and the world. Glynco has a dining room where 4,000 meals are served each day. Included on the campuses are residence halls, administrative buildings, and a wide array of recreational facilities for basketball, volleyball, tennis, soccer, billiards, ping pong, running, and swimming. There are also television lounges and a convenience complex that includes a barber shop, post office, laundry and dry cleaner, credit union, and convenience store. During the early 1990s, the center undertook a $144 million expansion program. FLETC added a second major facility in 1989, when the former Artesia Christian College campus in Artesia, New Mexico, became the FLETC Artesia Center. Artesia remains the principal advanced training facility for the Immigration and Naturalization Service (INS), U.S. Border Patrol, Bureau of Prisons, and other organizations with headquarters or large concentrations of personnel in the western United States. Artesia is similar to Glynco in the range of facilities offered, but it is smaller and houses fewer students at a time. As a result of significant increases in the size of the INS and Border Patrol, mandated by Congress in 1995, FLETC needed a facility for training these officers. Planners chose the former Charleston Navy Base and Naval Weapons Station in Charleston. Renovation of the base began in January 1996 with the intention of developing a facility that would mirror Glynco. Training would continue at that facility for as long as the build-up of INS and Border Patrol officers continued. Finally, in June 2001, FLETC chose a new site at the former Naval Communications Detachment facility in Cheltenham, Maryland. The 247-acre complex would become an area for firearms and vehicle operations requalification, and accordingly would contain facilities for simulations and exercises involving related skills. Construction began in late 2002, with completion scheduled for a year later. The principal basic programs at FLETC are the Criminal Investigator Training Program; the Land Management Training Program, designed primarily for officers of agencies with a land management mission, such as the U.S. Forest Service or the National Park Service; and the Mixed Basic Police Training Program, which was created for uniformed services with a security or police mission, examples being the U.S. Secret Service Uniformed Division or the U.S. Capitol Police. These and other programs at FLETC provide a combination of classroom instruction on hands-on practical exercises. Areas of study include firearms, driver training, physical techniques, legal, behavioral science, marine operations, enforcement operations and techniques, and security specialties. There are also advanced courses in specialized areas ranging from law enforcement photography to seized computers and evidence recovery. In addition to training for federal, state, and local agencies—in some cases through specially designed agency-specific courses—FLETC offers training to foreign agencies. This training focuses on three main areas: the Law and Democracy Program of the U.S. government; the Antiterrorism Assistance Program; and the International Law Enforcement Academy sponsored by the Bureau for International Narcotics and Law Enforcement Affairs. Calhoun, Frederick S. The Trainers: The Federal Law Enforcement Training Center and the Professionalization of Federal Law Enforcement. Washington, D.C.: U.S. Government Printing Office, 1996. Johnson, Kevin. "Recruits Flood Federal 'Boot Camp'." USA Today. (September 23, 2002): A3. "September 11 Leaves Facility Pushed to Its Maximum." Augusta Chronicle (Augusta, GA). September 2, 2002: B5. Federal Law Enforcement Training Center. < http://www.fletc.gov > (March 19, 2003).